If you are renovating your kitchen or you want a simple, transformative update, our stylish new countertops will change your space for the better. Invest in a functional upgrade for your kitchen with our stunning and affordable quartz countertops. With its ability to blend high performance with the beauty of marble, quartz has exploded in popularity since the turn of the century due to its durability, ease of maintenance, and virtually limitless palette of dazzling colors. Because quartz—unlike other surfaces—is nonporous, you can keep it 99.9% bacteria-free. 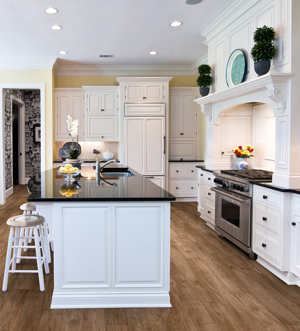 Quartz is also resilient enough to resist staining or corrosion from oils, liquids, and most cleaning products. Though nearly indestructible, most of our manufacturers offer a warranty—something a bit less common with than other materials. While we highly recommend quartz for its looks, durability, and value, our flooring store also carries attractive countertop options in a variety of materials, including marble countertops and stone countertops. Add a distinction and exceptional value to your home with new marble countertops. With its classic beauty, outstanding heat resistance, and durability, marble is an enduring favorite among homeowners. Each slab of marble is truly unique, and a well-maintained and sealed marble counter can potentially last hundreds of years—a truly timeless surface that can be enjoyed for generations. Though white marble is the popular choice, this natural, metamorphic stone is available in hues ranging from black and gray to yellow, green, and pink. You can choose dark, prominent veins or subtle patterns, paired with a polished or honed finish. Whether your style is rustic, traditional, modern, or contemporary, marble is at home in any decor. For classic elegance that is always in style, our stone countertops offer an exceptional beauty paired with a durability that stands up to decades of heavy use. For hundreds of years, stone has endured as one of the most in-demand materials used in construction and remodeling. Stones natural abundance and availability in large slabs make it a highly attractive option to upgrade your counters at an affordable price. When you are considering a makeover for your home, visit our showroom to explore our wide selection of kitchen countertops. Viewing the different types of materials, finishes, and colors available side by side enables your ideal choice to stand out among the multitude of options available. Our wide range of in-stock styles gives you the freedom to assess the pros and cons of each surface we offer and shop many name-brand options. One of the most popular names among our high-quality brands is Cambria™, an established, industry-leading provider of quartz countertops. As with all of the brands we carry, their products are created to meet the lifestyle and aesthetic needs of every client. Cambria is but one of the many manufacturers we sell, and our experienced staff is standing by to help you make an informed decision. If you have a preference of material or manufacturer, our sales experts can direct you to the available styles that suit your needs. Once you've decided on your new counters and made your purchase, allow our countertop installation professionals to handle the work so you can begin enjoying your new kitchen right away. Because quartz, marble, and store counters are heavy and require exact placement, we offer at-home installation to ensure a precise fit. When your installation is complete, your gorgeous new kitchen will be the envy of the neighborhood. When you buy new countertops from our flooring store, book a professional installation with our team. We have the experience and the equipment to make sure your new counters are placed correctly and without errors that may compromise their integrity. Make sure to ask about our 12 month fianacing options avaliable for our customers. If the layout of your kitchen requires seaming in the corners, our contractors align your countertops with precision, enabling a flawless seam. Because your satisfaction is our goal, every countertop installation we perform comes with our Ultimate Guarantee. At our local flooring store, we take great pride in the quality of our work. If you choose our knowledgeable staff to complete your installation, we stand behind our craftsmanship for the lifetime of your new countertops. In the unlikely event that you experience any installation-related issues, we will come to your home to make it right—at our expense. Contact us today, and choose stone, marble, or quartz countertops that will transform your kitchen. We proudly serve the communities of Painesville, Lake County, Mentor, Concord, and Willoughby, Ohio.